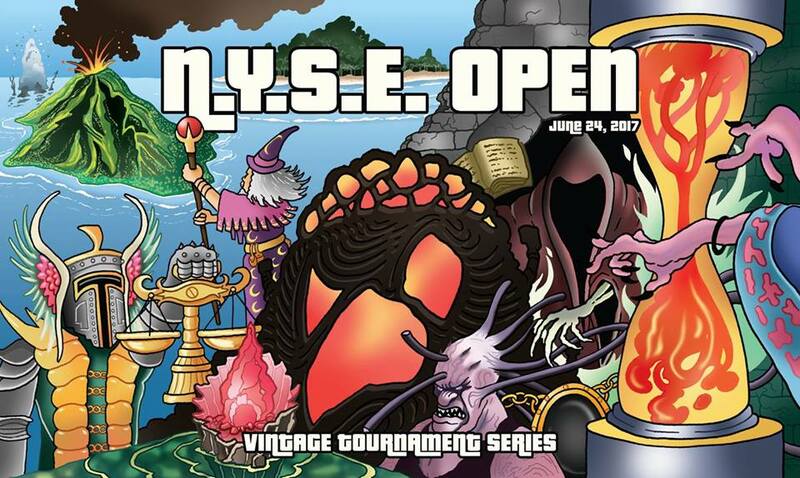 6/24/17 - Long Island, New York - NYSE Open V - Power Eight, Workshops & Drains Tournament! One of the best Vintage events of the year returns! 15 playtest card, non-sanctioned Vintage tournament. But since this is the N.Y.S.E. Open, the prize support doesn't just end there! The price on power and other assorted Vintage staples continues to go up, year after year, but maintaining the prize support of the N.Y.S.E. Open is something that I believe to be critical, and I am happy to offer that support again in 2017! There is a quiet tension between the many parts of a tournament; the prize support, the venue, the judge staff, the security staff, the giveaways and all the other hidden costs that most players aren't going to see (hello high-speed internet, photocopies, pens, table numbers, etc., etc., etc.). Last year, in order to maintain the prize support, I sacrificed with the venue, hoping that we wouldn't pay for it too dearly. We did, and that's my fault. I'm not going to make that sacrifice this year; for those of you who were there for N.Y.S.E. III, I am going back to that venue. I want all the players to be comfortable at the venue, and that will be assured there, as A/C won't be an issue, there is a restaurant/bar upstairs, and there are many affordable hotels within a short drive. In order to keep the prize support, improve from lats year's venue, keep the judge and security staff, keep giveaways and all the others things that people have come to expect, the entry fee has to go up. This year, pre-registration is $125. I'm not happy about this, but it's necessary in order to make the math work on everything. Additionally, and this is important, registration will be capping at 152 players. This is a hard cap. We had 157 players last year, and the attendance at the N.Y.S.E. Open has gone up every year; there will be players who want to play, and who are unable to play. In order to afford a venue in which I wouldn't have to cap attendance at 152, major sacrifices would have had to be made with either the prize support, or a major hike would have been required with the entry fee. I did not want to raise the entry fee as it is, so raising it enough to compensate for what some of the other (significantly more expensive) venues would have run, a considerable hike would have been necessary. This was unacceptable. In addition, as previously mentioned, the prize support (especially the top eight support) is something close to sacrosanct for me. If power and Workshops don't go out, it isn't going to feel like an N.Y.S.E. Open, and I'm not sure that I want to run that other iteration of an event. The N.Y.S.E. Open has not been run as a for-profit venture. Last year saw me take a hit on the day, and while I'm not happy about that, the event is run to effectively break even. When we went to major Vintage events, we spent a significant amount of time and money in order to get to the event. We spent for our travel, accommodations, meals and more. We did it because we were afforded the opportunity to spend a weekend with friends, enjoying their company as we competed for a prize that was worth competing for. I promise you that nobody is more upset about the entry fee hike than I am, but I hope that you can all understand that it was done out of necessity, and done in order to maintain the integrity of the event. If, at the close of pre-registration, there are still spots available, there will be a late-registration available for those remaining spots. Registration for the event, once pre-registration has closed is $150. All registration is non-refundable, so please ensure that you are able to make the event before you register. If the event hits max capacity, you are no longer able to make it, and there is someone else who is looking to attend, please reach out to me, and we will see what can be done to switch your registration to become their registration. Once the event maxes out, a wait-list will be put up. It is first come, first serve. If people who have previously registered to the maxed out event are unable to make it, making a spot available, the first person on the wait-list will have the opportunity to effectively buy their registration. Pre-registration will be up later this week. Pre-registration will close on Monday, May 29th at 12:00:00 (this means that you need to pre-register by Sunday, May 28th at 11:59:59). Regular registration will close on Thursday, June 22nd. In keeping with N.Y.S.E. Open tradition, there will be a pair of altered Karn, Silver Golems given away at the event! 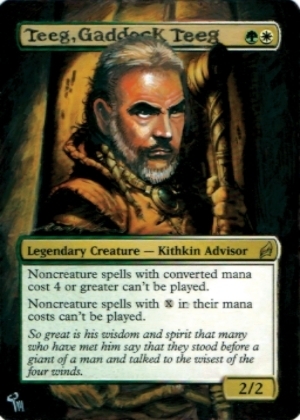 Earl Grant De Leon's (Poxy14's) Karn alters have added a wonderful touch to the event, and I look forward to sharing them with you as soon as images are available. 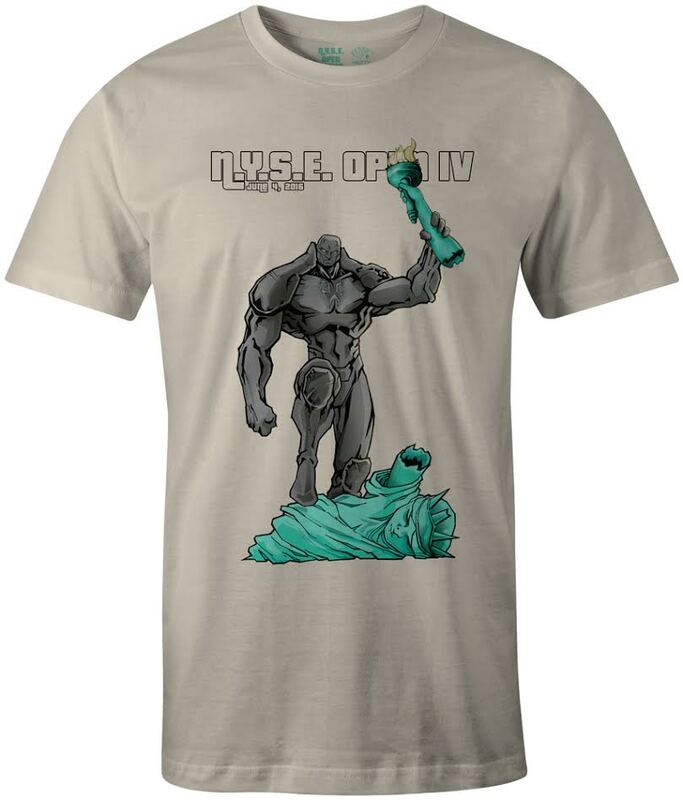 One Karn, Silver Golem will be presented to the winner of N.Y.S.E. Open V, and a second Karn will be given out to the best sportsman of the event! Will Andy Markiton and the Canadians defend their title? We'll have to find out! Magic is a great game, but most of the time it's a solitary one. 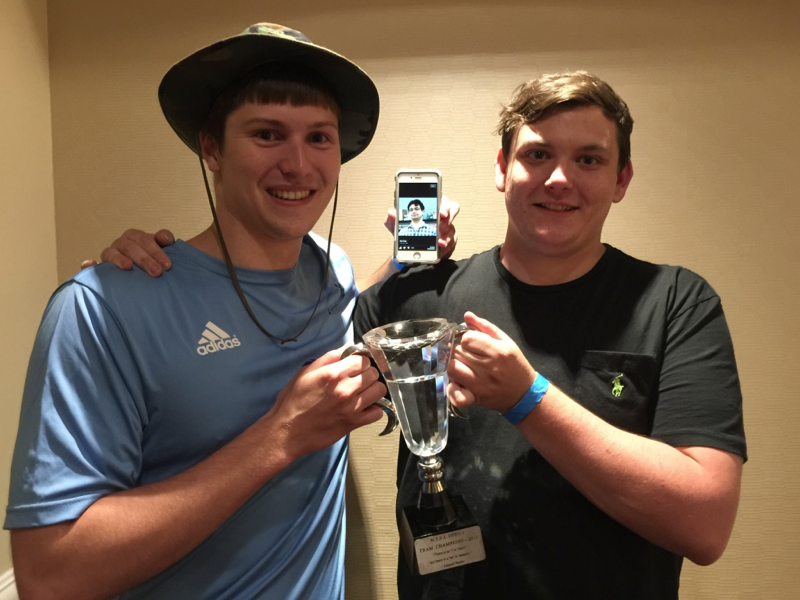 Team events are some of the most fun events in Magic (unless they're Limited! ), and as with tradition, there will be another team event at N.Y.S.E. Open V.
Entry to the team event is free! The winning team wins the team championship trophy! That team would earn three points for each match win (13 wins amounting to 39 points from wins). The team receives no points for losses, but does earn another point for its one draw, bringing them to a grand total of 40 points earned. In order to register for the team event, all you have to do is have the three team members write your team name on the top right corner of your deck registration sheet. P.C. team names are a must, so please don't use anything offensive/dirty. There will be fewer qualifiers available this year, in part because it's difficult to schedule them and make them work for other T/Os (where there are no date conflicts). 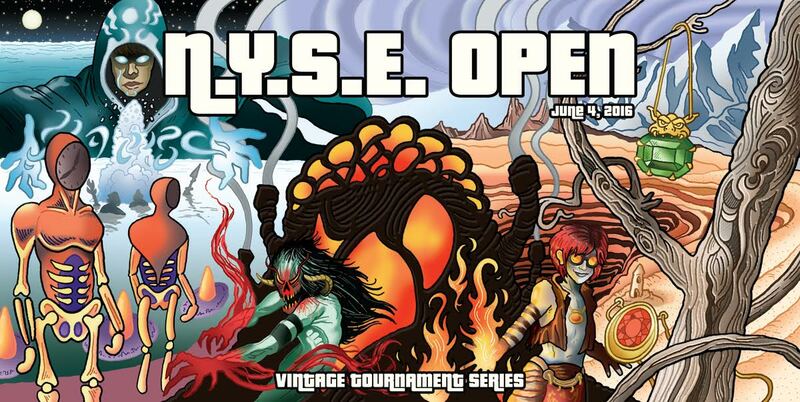 Qualifiers for NYSE Open V are currently sold out. Please see the list below for a list of the scheduled qualifiers. Use acetone to remove certain text from a card that's close to the intended playtest card (i.e. Lotus Bloom, with certain words removed to become a Black Lotus, Ancestral Visions with certain words removed to become an Ancestral Recall). Take pride in your playtest cards! Your opponents should know at all times what they are. Using 15 Swamps to make your playtest cards is a bad idea, as it's going to create confusion. 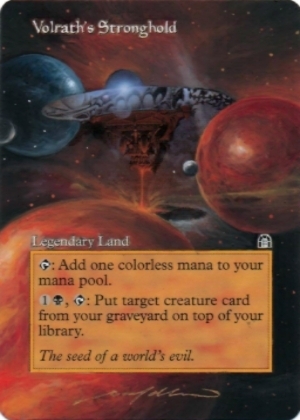 If you're making Moxen, please use a land from each appropriate color to make a playtest card for each according Mox (i.e., your Mox Sapphire is on an Island, your Mox Jet is on a Swamp, your Mox Pearl is on a Plains, etc.). Please use your best judgment when creating your playtest cards; we know what will and what won't be easily recognizable. Your opponents should not ever be at a disadvantage because you don't own the cards. There is nothing wrong with using playtest cards as you slowly pick up the cards that you need to play Vintage, but please consider your opponents while you're making them, as we're out to make this an enjoyable experience for everyone involved. One of my favorite aspects of the Vintage community is that we look out for each other, whether it's constant vigilance to counter potential thievery, or the day to day stuff that mostly goes unnoticed. Let's all do what we can to make this event as special as we can for our fellow aficionados of Magic's greatest format. Using paper printouts of card faces and gluing them to cards is not acceptable! This alters the thickness of the cards, making the cards marked for all intents and purposes. Please don't do this, as the judges will be instructed to consider these as marked cards, and enforce punishment according to DCI Competitive REL event standards! If you're worried that your playtest cards may not pass muster, please speak to the head judge of the event before the event starts. Leave enough time to create new ones. Site security, as with all N.Y.S.E. Opens, will be present, and will be tight. Wristbands will be issued to all players and staff members, granting them access to the ballrooms in which games are being played, in addition to granting them access to the two dealers on site. Individuals who have come looking to deal with our dealers will have a separate wristband that will grant them access to the dealer-area, but not the play-area. There are cameras in the rooms, there are cameras in the halls, and theft is going to be taken exceptionally seriously. If you are caught stealing, you will be banned from all future events I run, you will be arrested, you will be prosecuted. This is a very serious matter, and it will be taken seriously at the event. You will not be able to leave the venue with any bag(s) that don't match the wristband(s) that you are wearing, so please plan accordingly. In four N.Y.S.E. Opens, we have had zero thefts. That streak will be kept alive. Greg Fenton is the master behind the iconic images that you see for each N.Y.S.E. 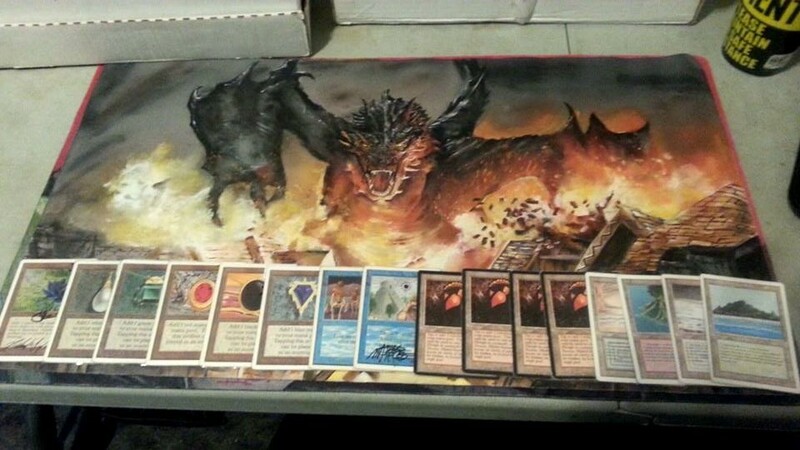 Open playmat. He has done incredible work for this event in the past, and I look forward to sharing this year's image with you once it's available. Greg will have a limited number of playmats with him the day of the event, priced at $40 each. If you are interested in a playmat, I highly recommend purchasing one from him as soon as you see him that day. Greg will have a station set up at the venue with the mats. Once they're gone, they're gone! There will be an N.Y.S.E. V t-shirt this year. As soon as the image is made available, I will share it. In keeping with tradition, and thanks to the efforts of Will Magrann, there will once again be commemorative dice available at this event! This year's dice will look nearly identical, with the only difference being the change between Roman numerals. If you'd like to purchase dice, they are $1 per, and will be available the day of the main event, at a separate table. As with the last two years, there will be video coverage of the event, in large part thanks to Mike Lupo. A Twitch stream will be set up before round one. Once the link is good, it will be posted here, on Facebook and on Twitter. 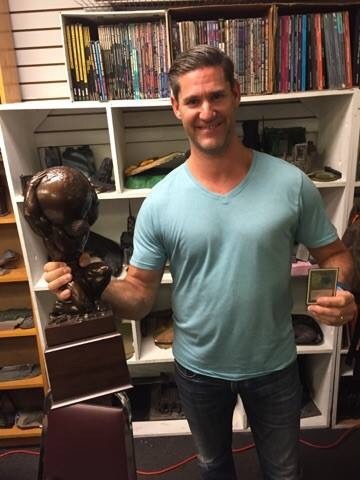 As with past years, there will be a Friday Night Vintage tournament held at The Comic Book Depot! $10 entry, 15 playtest card, non-sanctioned Vintage tournament. All entry fees will add a commensurate amount in store credit to the prize pool. At the end of four rounds, credit will be split between the players who finished with 4-0, 3-0-1 and 3-1 records. This event will be complete before 11:00 pm, giving you an opportunity to jam some Vintage and practice for the event all while you don't sacrifice your night's rest. Sunday Old School Magic at the Depot! 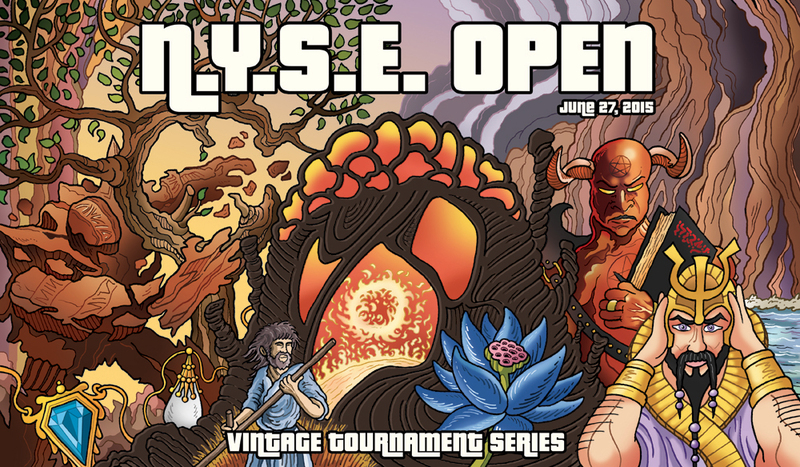 Finally, there will be an Old School tournament on Sunday to close out the N.Y.S.E. Open weekend! 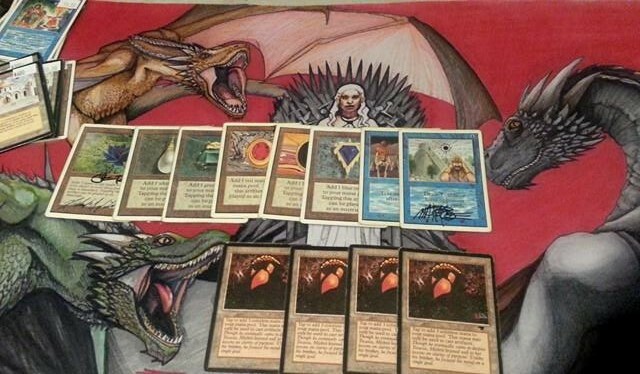 $20, un-sanctioned Old School tournament. $20 credit will be added to the prize pool for every entrant beyond the twentieth. Depot has a wide selection of great cards, and will provide any victors with a great chance to pick up some cool stuff to add to their collection. Card Titan and Black Magic Gaming pay to vend at the N.Y.S.E. Open. We all love this game, but love alone doesn't pay the bills; their support makes the N.Y.S.E. Open possible. There will be absolutely no buying and selling of cards at the N.Y.S.E. Open unless you are dealing with one of the two authorized vendors. Trading is acceptable, but no cash, PayPal, Venmo, Bitcoins, krugerands, etc., should be trading hands. Dealers deal, and the payoff is that we have places to play. Please help make this a great day for everyone. This event will be a great success nick. I'm stoked for this event. Is there another hotel that you'd recommend nearby? I have a ton of traveling to do the first half of the year, unfortunately, but I am going to try to make this happen. This is one of the best events of the entire year. Thank you for doing this again. Im in, happy to see it back at the hotel, that was a solid venue. Worth the extra $25 for sure. @thecravenone I think the last time we did this here there were issues for some people getting hotel rooms because it was around the time schools were graduating. @thecravenone I'd recommend the Holiday Inn at Plainview. It should be cheaper, in addition to also being very close to the venue. If you need further recommendations, I can check around and see what's available, but much of the information that I'm going to be getting is just via Google. Because Calvin of Black Magic Gaming is the man, we have bumped up the prize support for 13th-16th to a blue Revised dual land each. They will be drafted according to final standing. Many thanks to you, Cal! Secondly, the five qualifiers for NYSE Open V are now booked. I may schedule 1-2 more for The Comic Book Depot, but that will be it. Seems like a lot of hotels in the area are already sold out. Probably graduations. I'd suggest making arrangements now if you even think you might need one. Can always cancel the reservation later. We have some extraordinarily good news for you. 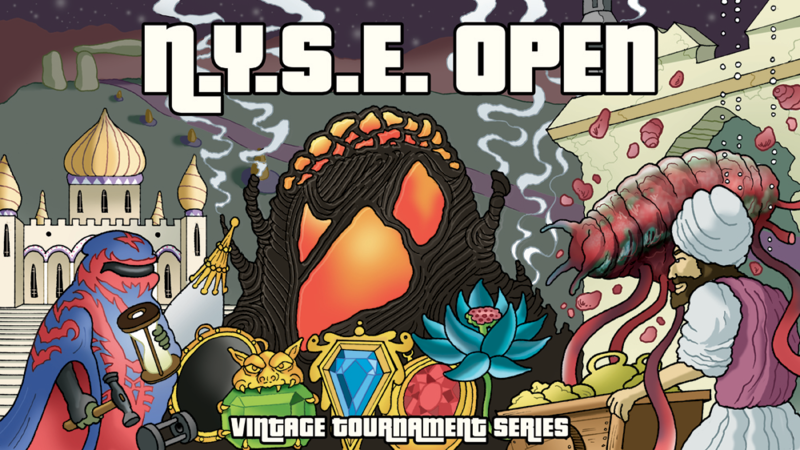 Going forward from EE6 (March 18 and 19th in Baltimore, hosted by Tales of Adventure), the Vintage portion will also be an NYSE qualifier. The NYSE will be a qualifier for the next EE Vintage event as well! Basic gist is that if you win one of these events, you're locked into free entry to the other event. This March's EE Vintage event will be an NYSE 5 qualifier. 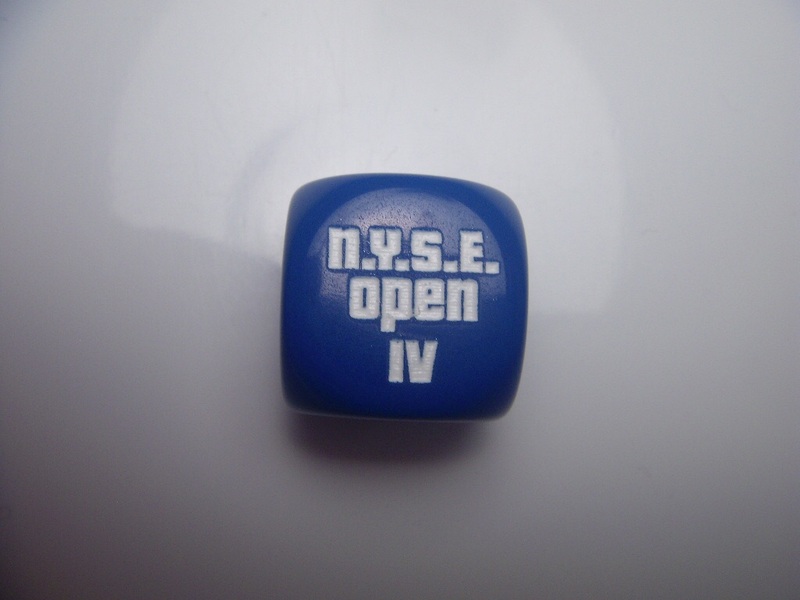 The NYSE 5 will be an EE7 qualifier. EE7 and 8 will also be an NYSE 6 qualifier. You get the idea. Now for the even funnier part; BMG will be paying the entry for anyone who T4's either event and attends the other. On top of that, if you win either of these events and plan to attend Eternal Weekend(hosted by Card Titan), a sponsorship of sorts is in the works. Hope that clears up the new info. Any questions can be directed to, well, me. Prereg for both EE6 and NYSE 5 is in the works and hopefully will be up in the coming days. Spread the word folks. We hope to see you there. ked into free entry to the other event. This March's EE Vintage event will be an NYSE 5 qualifier. 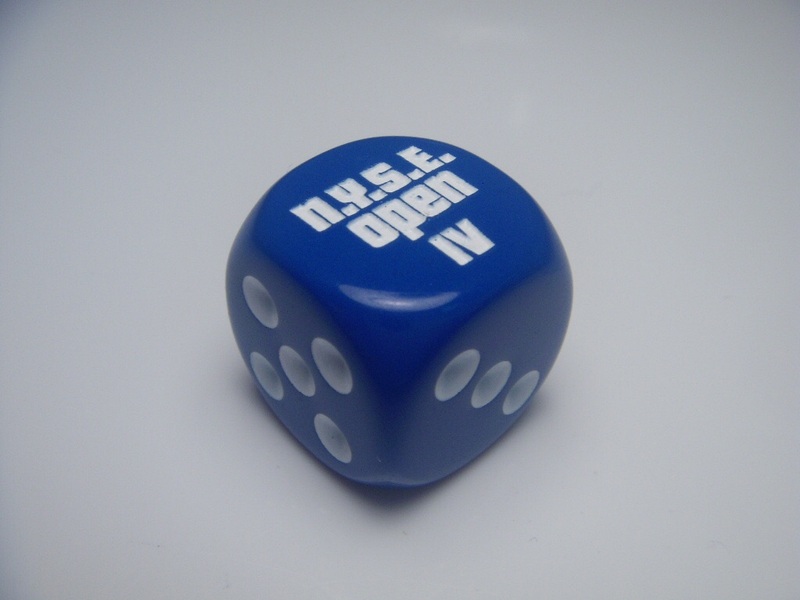 The NYSE 5 will be an EE7 qualifier. EE7 and 8 will also be an NYSE 6 qualifier. You get the idea. This all seems great and I plan on attending NYSE V. Where has EE6 been announced, other than in your post? I'd like more details on that event too. @MikeTheProf I believe that Cal is waiting on a few things to finalize before he makes the official announcement, but that should be up relatively shortly. 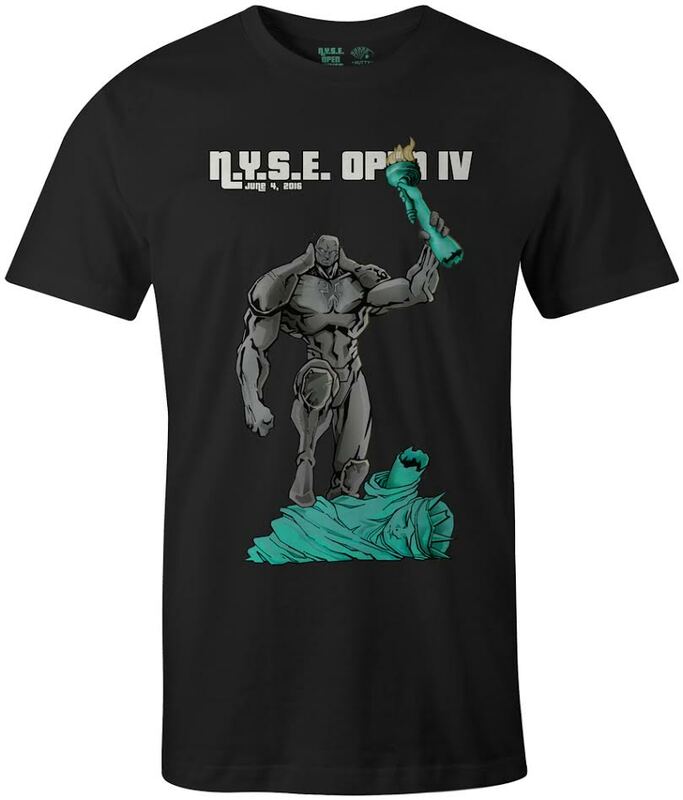 Pre-registration for NYSE Open V is live! If you've got any questions, shoot me a PM and if I can help, I will. If I can afford the trip I'll go. I'm still not sure if it's going to work out though. I'd love to see everyone and experience the event. @Islandswamp Let me know if theres anything I can do to help, just PM me on the site or via fb (its Hunter) Im quite certain something can be done. I know for sure I can't preregister for a few weeks probably. Right now things are tight, plus I have to convince my wife that it's a good idea.to go. 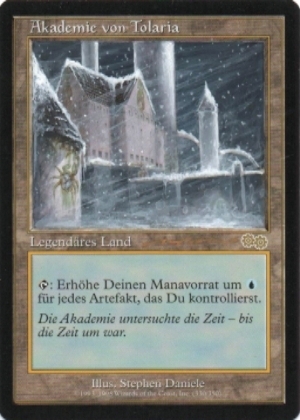 For proxies, would Collector's Edition cards be acceptable? @MikeTheProf Likely yes, but that will be a decision for the head judge of the event, whom we're waiting on confirmation.